ukiyo-e | Where is Paperwoman? Mokuhanga Back in the Limelight. A paper vendor’s view. 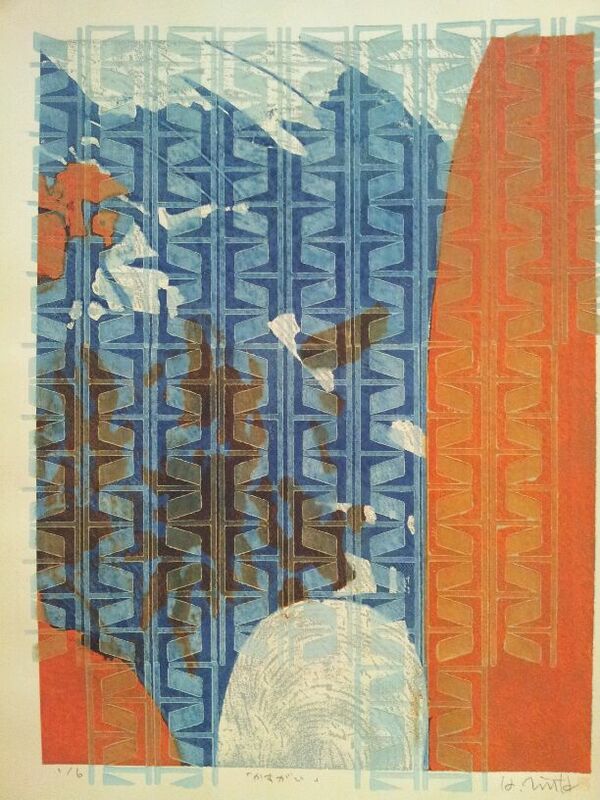 The Japanese woodblock print or mokuhanga, is a precise, multi-step printmaking technique, using water-based pigments applied with brushes, not rollers. 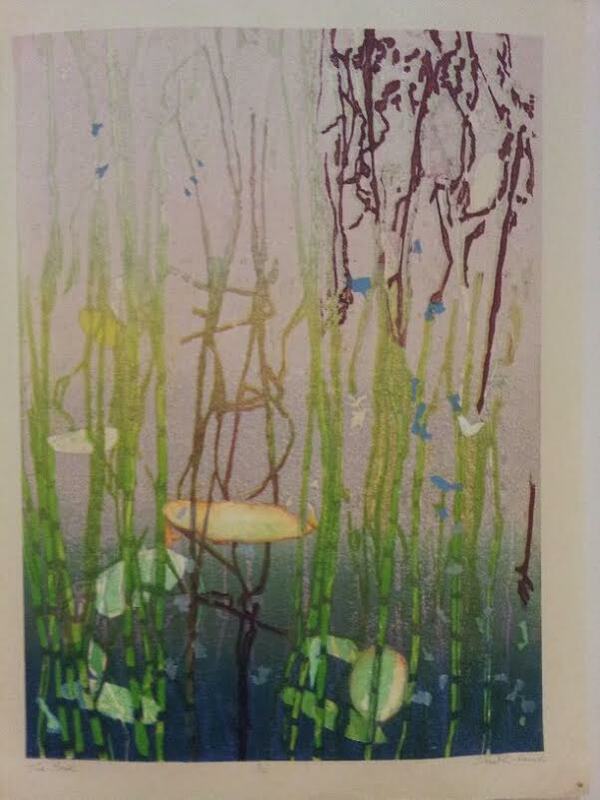 The latter may give you some of idea of how mokuhanga differs from the western woodcut print. The paper (usually washi) is moistened, laid on block and a baren is used to rub back side of paper. 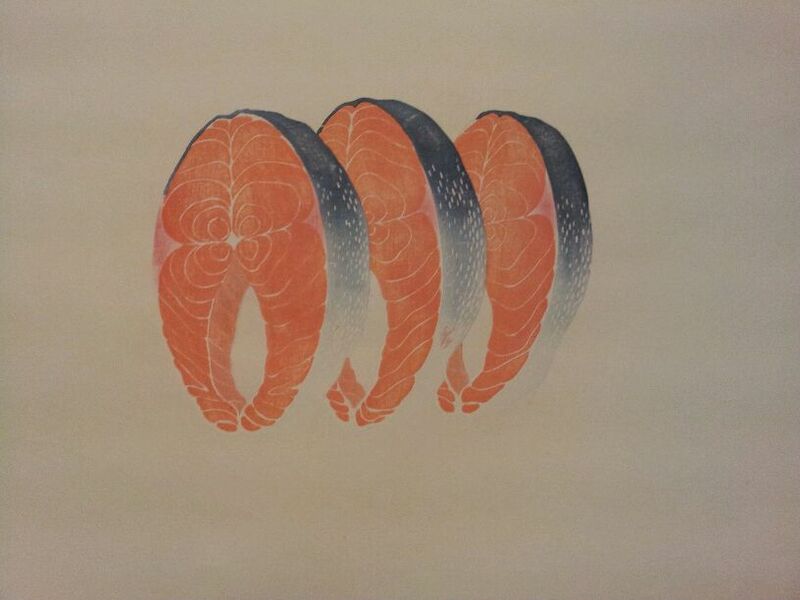 This multiple-colored block print form became popular during the Edo period (1603-1867). Many of the old techniques are still followed. 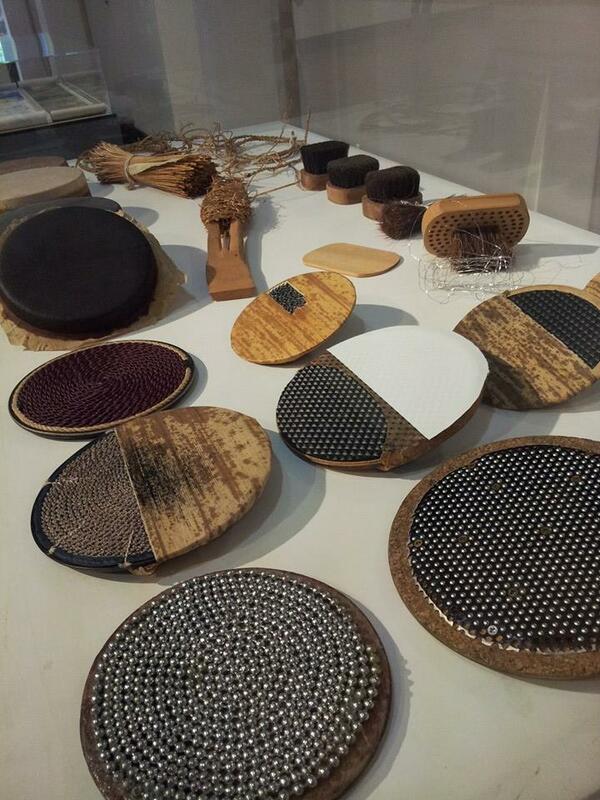 What has mostly changed is the growing awareness and broad spectrum of artists who are adopting their individual styles and at the same time, spreading the word about the unique process of mokuhanga. At the beginning of my career involving Japanese arts and crafts, I was privileged to curate a collection of “ukiyo-e” prints. The term ukiyo-e translates as Images of the Floating World. The masters of ukiyo-e laid down the base and framework for contemporary woodblock prints. 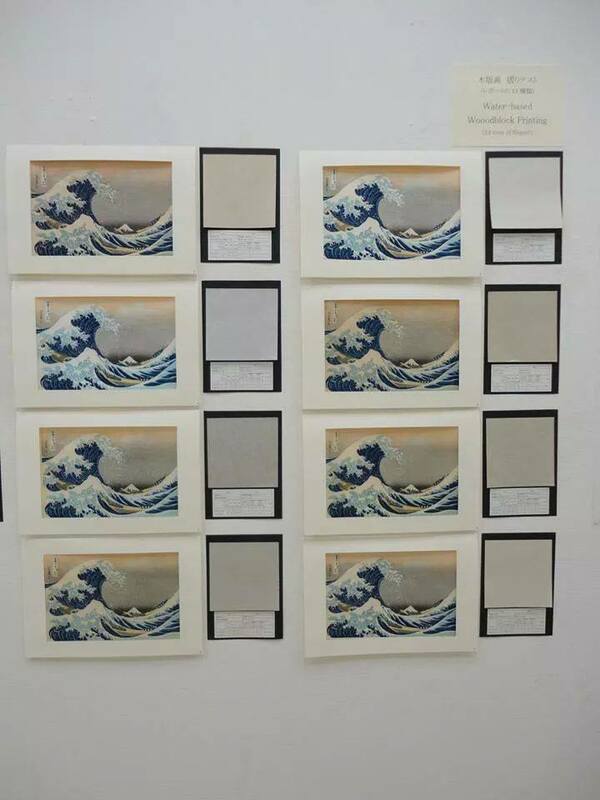 Here HOKUSAI’s The Great Wave off Kanagawa (from a Series of Thirty–Six Views of Mount Fuji) is shown printed on various washi with sizing and without; a research chart presented by Awagami Factory at Tokyo University for the Arts using Japanese paper from different parts of Japan and different sizing recipes. I thought this was a brilliant depiction of how different papers yield different results for the same print. 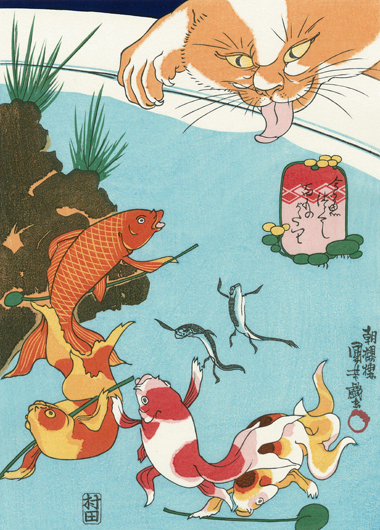 KUNIYOSHI’s prints of anthropomorphized animals, show just how colorful and how may colors applied in these mokuhanga from 150 or years ago. 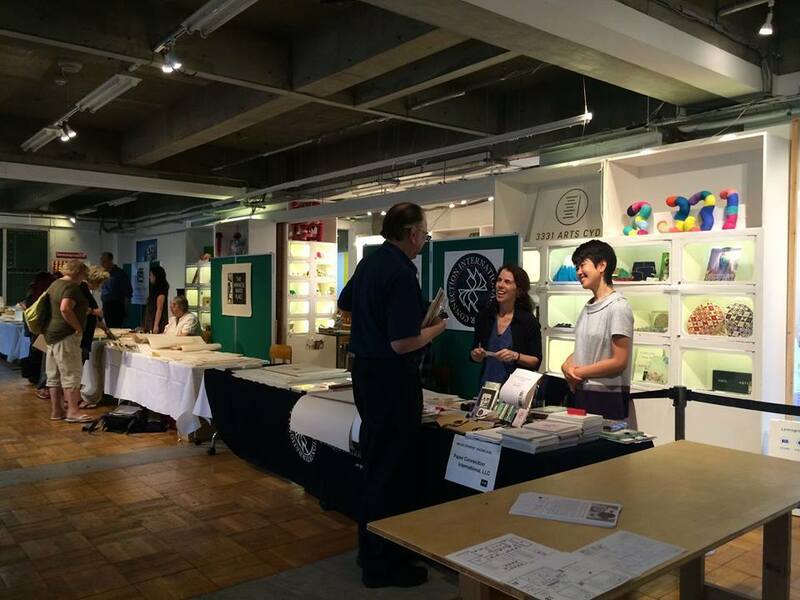 I learned a few important facts about mokuhanga, even in just preparing for our booth for the 2nd International Mokuhanga Conference, (now the 2nd one), hosted by Tokyo University for the Arts, September 10-14, 2014. I learned what type of paper is in demand in the West, where mokuhanga seems to be more popular than it is in Japan and that the papers used primarily by artists in the West are much thicker than what the ukiyo-e artists used. 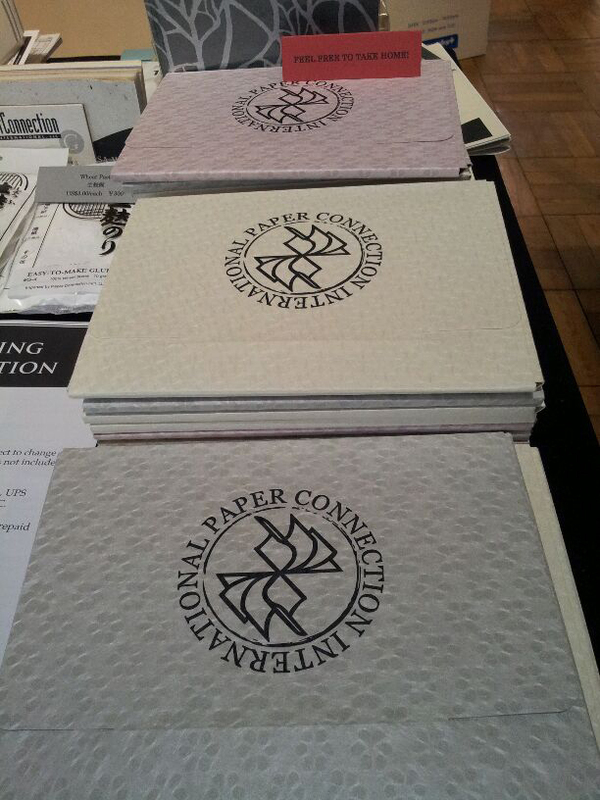 Paper Connection created this special swatch portfolio just for the conference. We included 11 different papers, with a few surprise papers made from alternative fibers, and with unusual sizing. What a joy it was to meet so many talented printmakers from all over the globe and learn from them directly; discussing their criteria for papers for their artwork. Saw some old friends like Larry Pinto, Marjorie Tomchuk, Michael Durgin and met some lovely new friends like Mia O, Carla Salem, and Claire Cuccio. As within any discipline of art, the desired paper and its use, is as unique as the individual using it. From the paper seller’s view, Paper Connection welcomes any and all queries, as this only helps us become better at what we do. 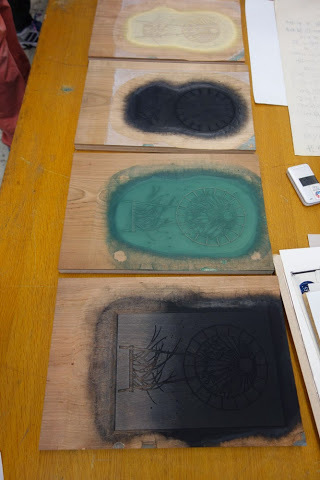 In addition to the IMC ‘s mission; to reinstate the integrity of mokuhanga; in effect, bring it back to the limelight, MI-LAB Art Residency Program forged by Ms. Keiko Kadota has provided a place for artists from all parts of the world to collaborate and learn about mokuhanga in depth. I had the pleasure of meeting and also hearing a talk by Elspeth Lamb, author of Papermaking for Printmakers, and who is on the Board of Glasgow Print Studio. April is currently working on her soon-to-be published book, called the Japanese Woodblock Workshop. 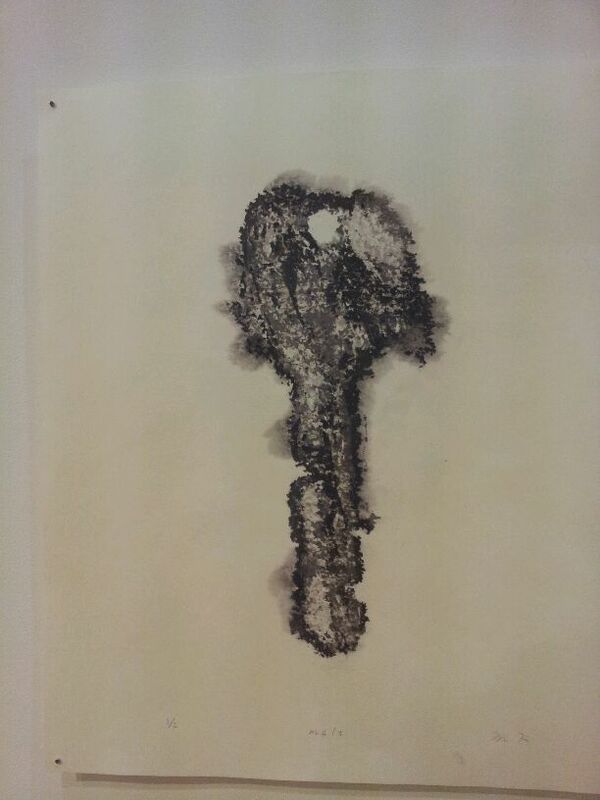 Please peruse through a few of the prints I saw during the conference. 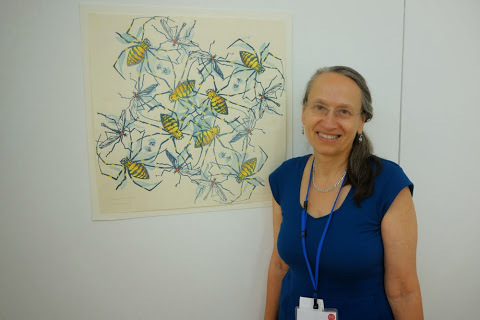 Printmaker, Ms. Yoonmi Nam, who teaches at the University of Kansas, wrote an excellent summary of the conference and posted it in Printeresting. Click links to read and see her super photos of the art and the artists at the conference.